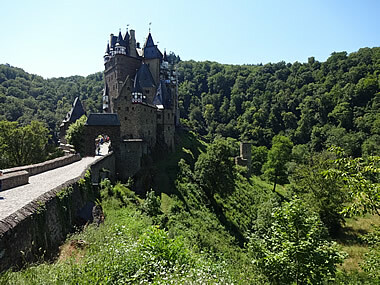 A meticulously planned couple of days taking in beautiful Burg Eltz and a number of Rhine castles between Coblenz and Bingen. 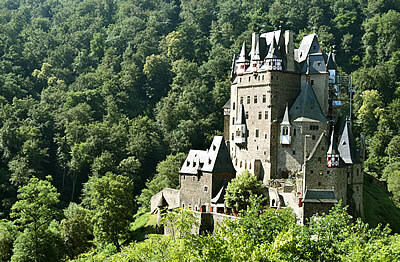 Burg Eltz in the Mosel Valley is one of the most Romantic castles in Germany. 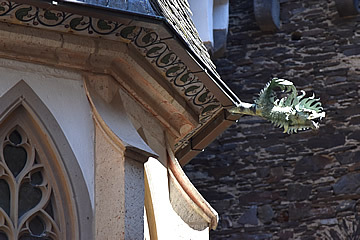 It sits on a rock in a deep wooded valley in a loop of the Eltzbach which flows into the Mosel River. 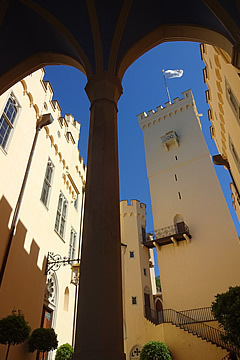 The castle has remained in the hands of the same family for over 800 years since it was first built. 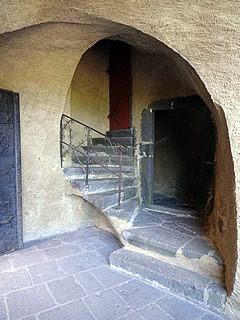 Leading to the inner courtyard. 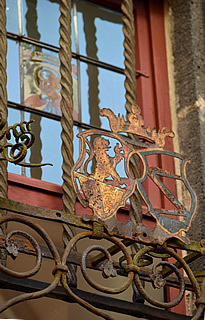 The Eltz coat of arms in ironwork. 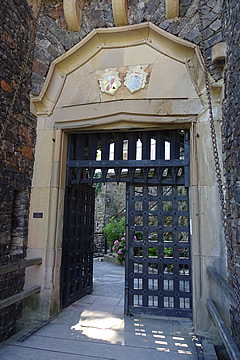 In the thirteenth century the three brothers of the family had such a strong dispute that the castle and estate were split into three parts. 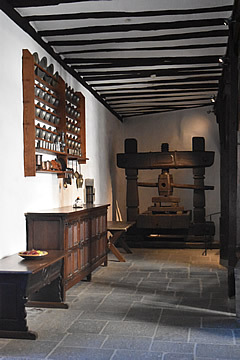 Each family had their own set of apartments and service quarters such as kitchens. 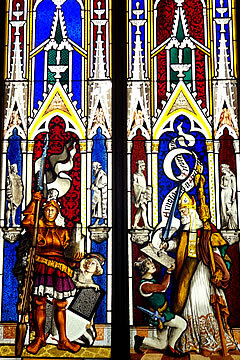 The lines were named "with the Gold Lion", "with the Silver Lion" and "with the Buffalo Horns". 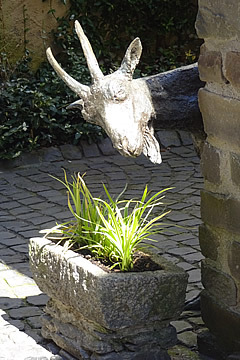 By the 18th century the line Rodendorf "with the Buffalo Horns" had died out, their share being transferred to the Kempenich "Gold Lion" family. 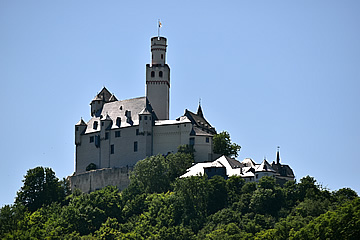 In 1815 the Rubenach "Silver Lion" family sold their share and the Eltz-Kempenach line became the sole owners of the castle and estates. 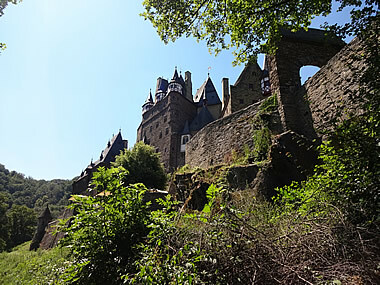 High above Burg Eltz are the ruins of a siege castle, Truteltz, built by the Archbishop of Trier in the 14th century to bombard Burg Eltz. This was the last battle action seen by the castle and, though the family lost the dispute, they were required only to destroy most of the fortifications, not the castle itself, and were allowed to continue living there. 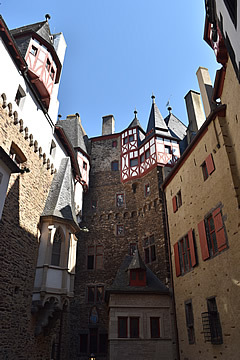 The only way to see the inside of the castle is to go on a guided tour, and photography is forbidden - it is still privately owned by a count who does not allow photography inside. 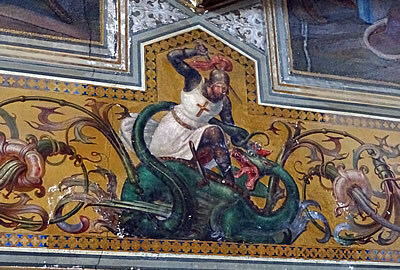 A small armoury first with one suit of armour that looked like an alien! 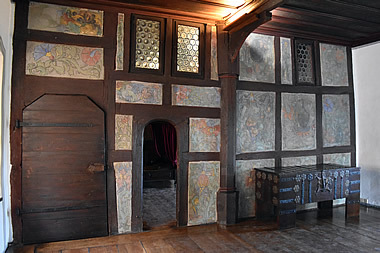 A large living room with tapestries, heavy wooden beamed ceiling, and large wooden medieval storage chests. 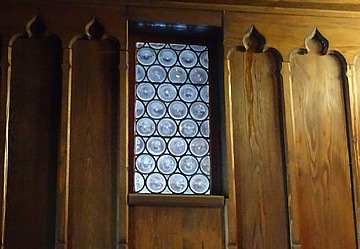 The very thick walls can be seen at the window seats. There is a fine painting by Lucas Cranach the elder - Madonna with Child and Grapes. 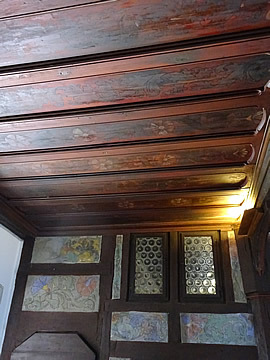 A bedroom (the Rübenach Upper Hall) with beautiful painted walls and ceiling (15th century) and a four poster bed with steps up to it. 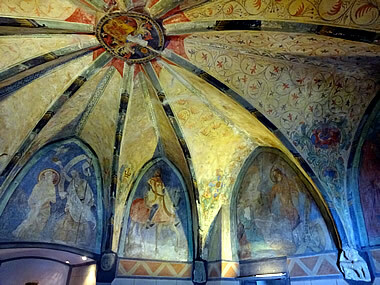 The tiny chapel in the room is in a large niche with a half-dome roof so that there is no room above it. A dressing room off the hall also has lovely painted walls and ceiling. 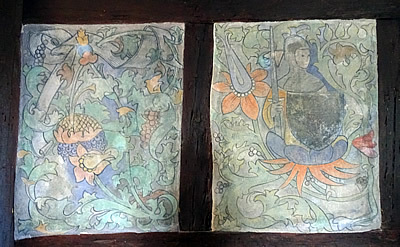 The Knights Hall was being restored, the walls and doors being painted with patterns - they had been plainly painted over. A stone sculpture of a face with slightly open mouth signified that anyone could speak freely in this room if they spoke the truth. 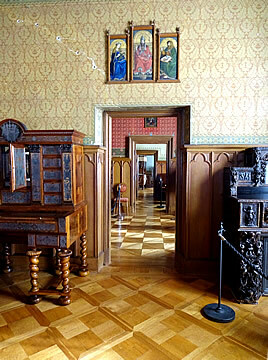 The rose of silence above the exit signified that what was said remained in the room and was not to be discussed outside. 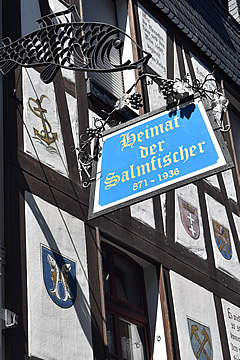 A number of further rooms and a children's room with a 16th century wooden painted marriage bed, the oldest in Germany. On the headboard the coats of arms of the bride and groom's families. 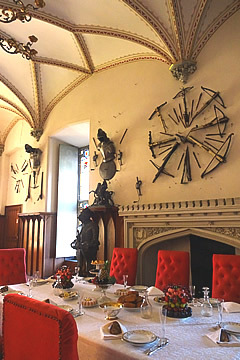 These rooms were by far the best of any of the castles we saw during this visit. 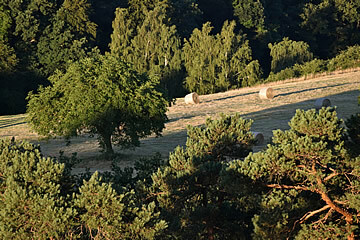 View from our balcony - with a long lens! 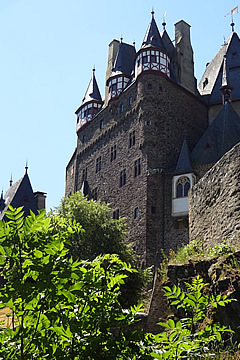 We were staying at the Wyndham Gardens on the east side of the Rhine, south of Koblenz. A strange hotel. The public areas seemed geared to coach parties, the ground floor restaurant was vast and lacking any atmosphere with a huge buffet with nothing very enticing on it. There was a bar that did some food but with a very restricted menu. The top floor restaurant, which must have fabulous views, was closed. 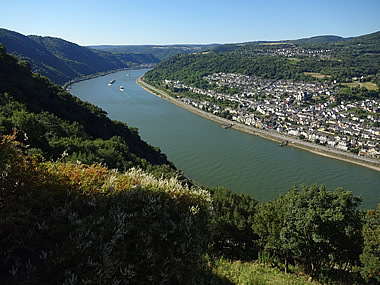 We had a room on the twelfth floor which had an amazing view - upriver to Marksburg on the west side of the Rhine, and down river to Stolzenfels. We spent both evenings here on the balcony with the view spread out before us, one evening with wine and snacks to avoid the hotel offerings! 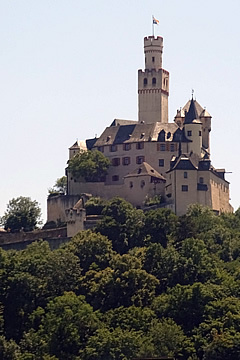 Schloss Stolzenfels above the Rhine. 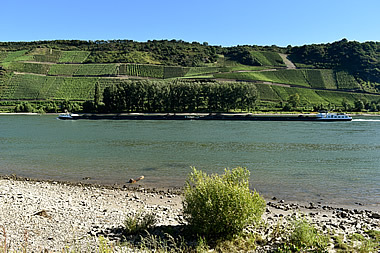 A Rhine barge and riverside vineyards. 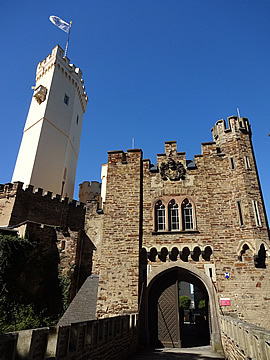 We explored the castles on this stretch of the Rhine starting in Lahnstein on the east bank, driving south and crossing on the ferry at Rudesheim then working our way north. We bought a very good guide book "The Castles of the Rhine Between Coblenz and Bingen" so that we could learn a bit more about what we were looking at. Panoramic view from our room balcony. We started and ended the day with Schloss Stolzenfels. 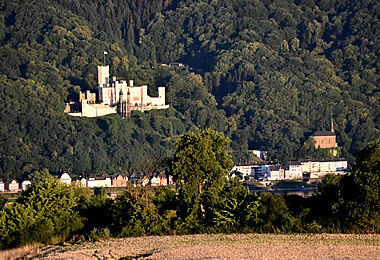 It is an easy drive down to the Rhine from the hotel and a short walk down river to get good early morning photographs of the castle across the Rhine. 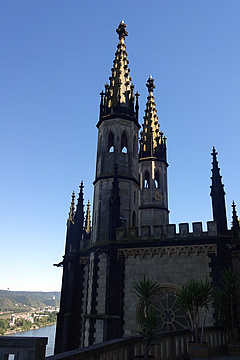 Neo-gothic chapel above the Rhine. 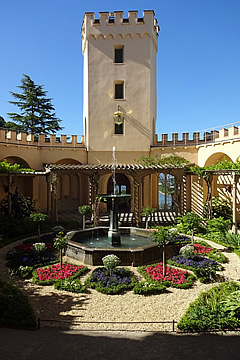 The pergola garden and northern wall of the castle. 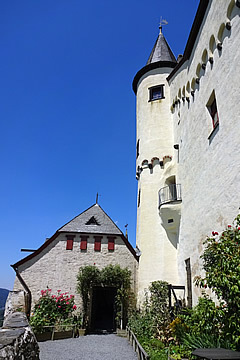 There has been a castle here since the thirteenth century but it was substantially burnt down by the French during their siege of Coblenz in 1688. 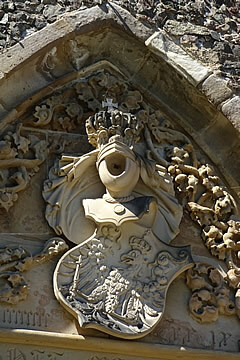 Coblenz obtained the ruins in 1802 and later gave them to the Royal Family. 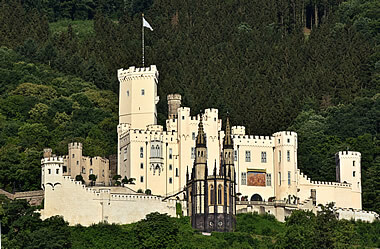 King Friedrich Wilhelm IV had the present Romantic castle built and moved in with his wife, Elisabeth of Bavaria, in 1842. 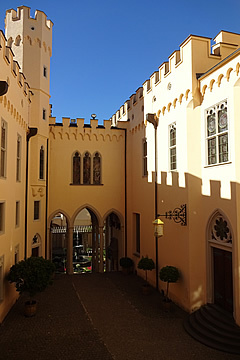 The inner castle courtyard looking north to the open arcade hall and the pergola garden beyond. 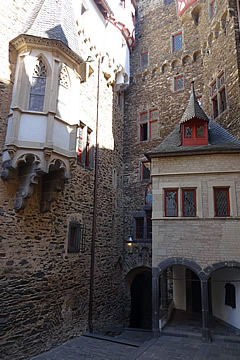 Inner courtyard from the arcade hall. 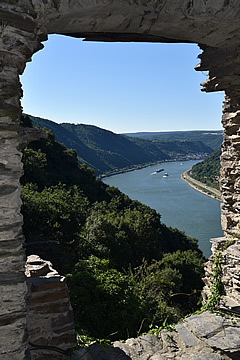 The lower level summer hall on the east side is open for views of the Rhine and cool summer breezes. 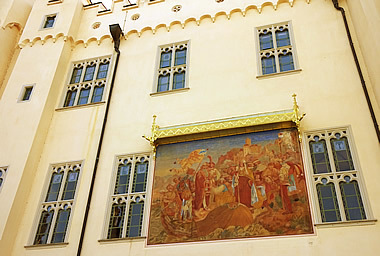 Fresco on the east wall of the castle. 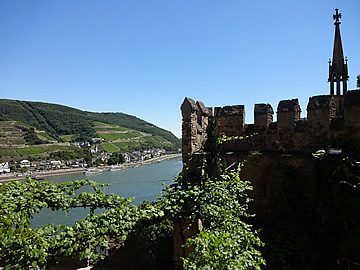 The site of Marksburg, on a hilltop on the east bank of the Rhine, has had some kind of fortified residence for over 700 years. 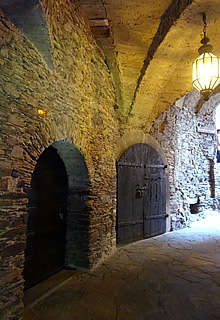 The original wall enclosed a great hall and a chapel. 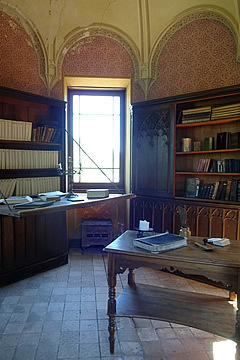 Building continued through the Gothic era and the fifteenth century. 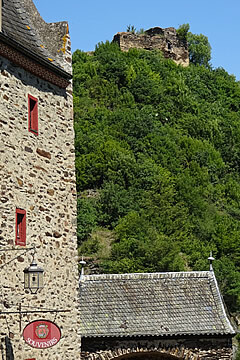 The castle retains much of its original appearance, it survived the Thirty Years War almost unscathed, though there was some fire damage in 1705. 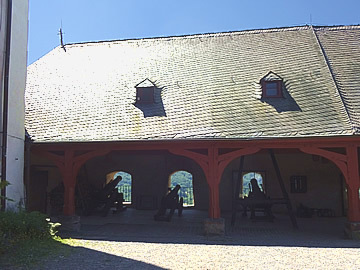 Cannon in place overlooking the Rhine. 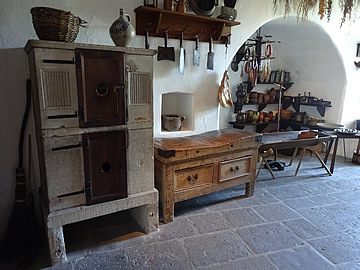 The double stone cupboard on the left is to keep foods cool. 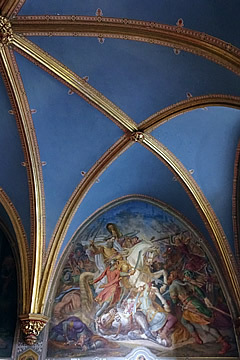 Painted walls in the Knights Hall. 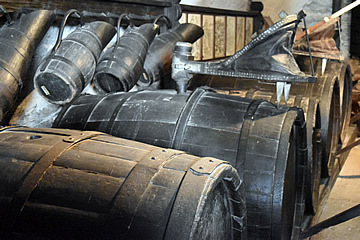 In medieval times water was regarded as less healthy than beer and wine, and beer was drunk with most meals in northern europe where grapes were not a common crop. 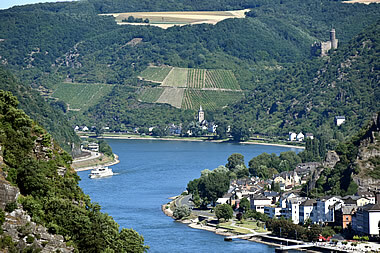 However the Romans introduced viticulture to the Rhine region and wine would have been quite a common drink here. 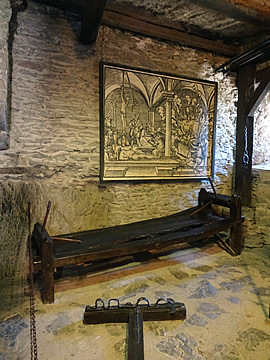 The former stables is now home to a rather gruesome exhibition on medieval torture. 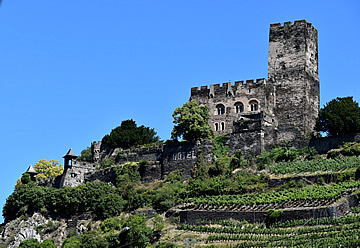 Liebenstein Castle on the east side of the Rhine, now a hotel, dates from the thirteenth century but fell into ruins at the end of the sixteenth. 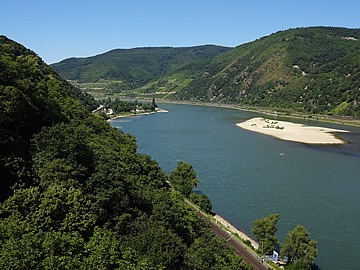 View upriver from Liebenstein, the town of Bad Salzig on the west bank. 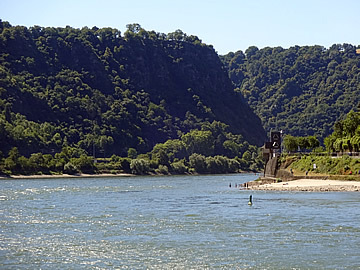 The steep cliff of Loreley jutting out into the Rhine. 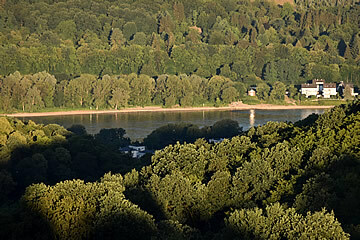 A little upriver the Rhine curves around the steep cliff of the Loreley rock. At this point the river is 25m deep and only around 110m wide so the water flows fast, a very dangerous stretch of water.3 Various legends are attached to the rock - a woman who lures sailors to their death, a distraught lover flinging herself from the rock to die in the river below. A new visitor centre was being built and the site was a bit of a mess but it was still possible to get to a down river viewpoint. We also walked around to see the upriver view but that wasn't quite so good. 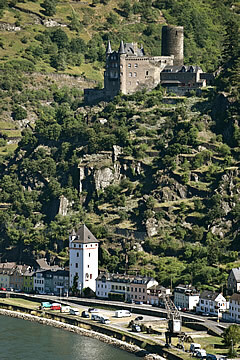 Maus Castle (Deuernburg) above Wellmich at the extreme north of the view from Loreley. 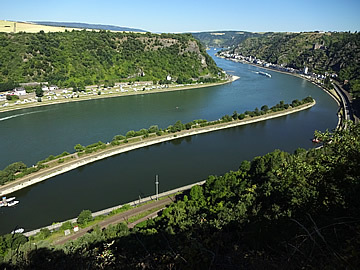 View down river from Loreley. 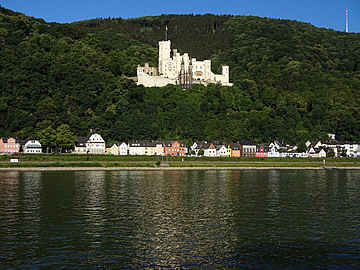 Katz Castle above Sankt Goarshausen seen from Loreley. 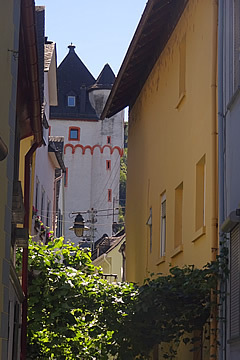 Sankt Goar and Sankt Goarshausen face each other across the Rhine, down river from the Loreley. Sankt Goar across the river from Sankt Goarshausen. 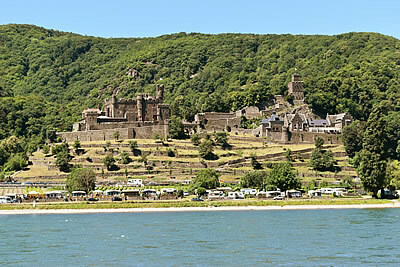 Rheinfels Castle above Sankt Goar. 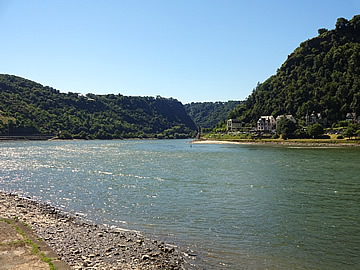 The Rhine south of Sankt Goarshausen, the Loreley. 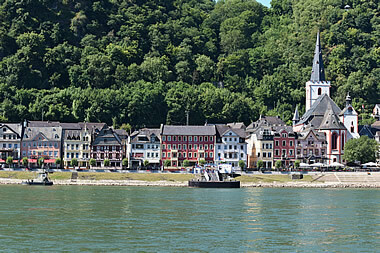 On the east bank Sankt Goarshausen has a pretty and peaceful Alt Stadt. 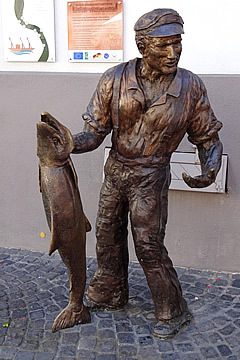 Salmon fishing once thrived here. 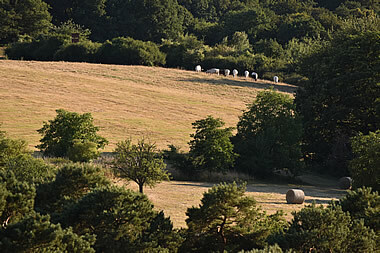 The goat was once kept in such large numbers that it became a symbol of the town. 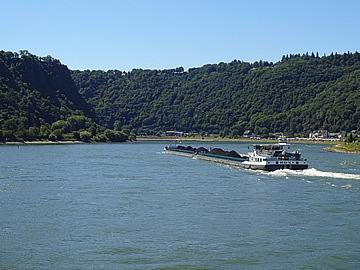 A coal barge heads upriver past the Loreley. 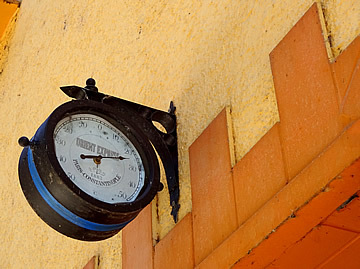 This must have come from a station platform: it's an 1883 Paris-Constantinople Orient Express thermometer. 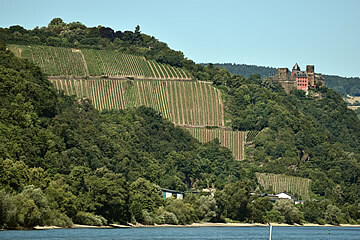 Vineyards on the banks of the Rhine and Schönburg Castle. 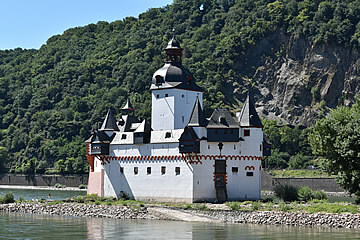 Continuing south along the east bank of the Rhine we stopped to take photos of Pfalzgrafenstein Castle which sits on a small island in the middle of the river near Kaub. 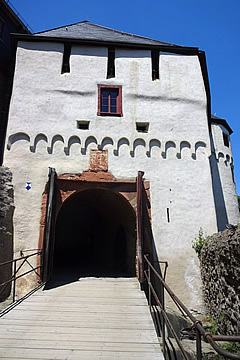 It was a toll castle, and though small, it was fortified with an artillery bastion and a 12m high 2.6m thick ring wall. 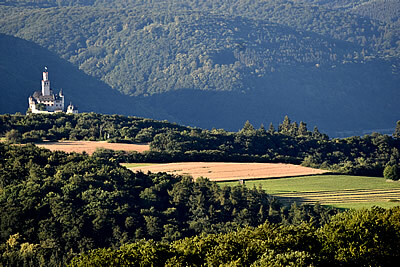 Gutenfels Castle above Kaub is in private hands. 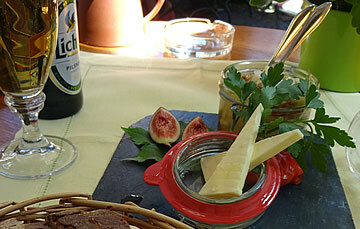 An unusual starter "Handkaese mit Rheingauer Musik" of marinated cheese with nuts and raisins. 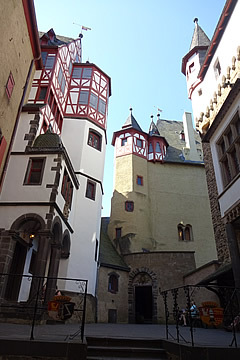 We had a really good lunch in Rudesheim at Breuer's Rudesheimer Schloss. It wasn't quite what we were expecting, rather a lot of tourists, but the food was excellent. 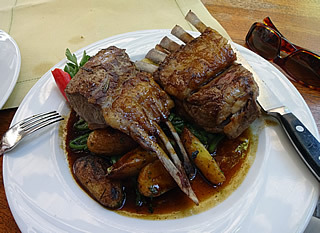 Superb rack of lamb at lunch. 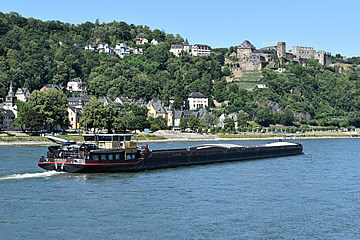 After lunch we took the car ferry across the Rhine. 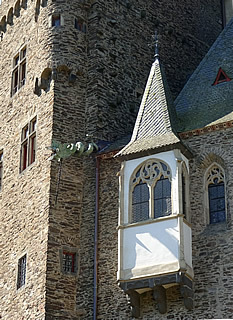 Burg Rheinstein just north of Bingen was restored in the early nineteenth century but still has some features from medieval times. The furnishings are relentlessly nineteenth century. 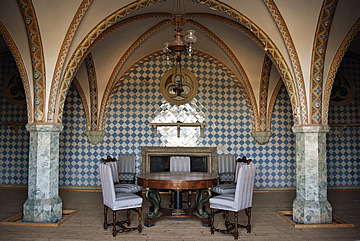 The owners had a penchant for writing rooms in towers with terrific views of the Rhine. 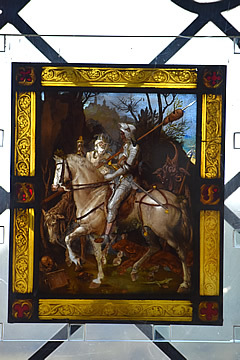 "Knight, Death and the Devil" after Dürer (1840/50). 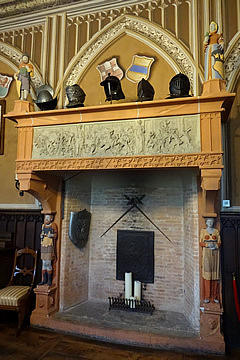 16th century fireplace in the Rittersaal, brought from a Cologne house. 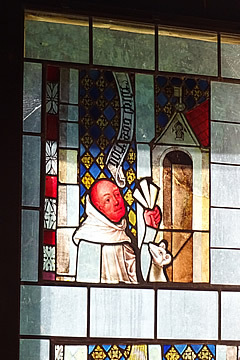 14th century stained glass in the Kredenz-zimmer. 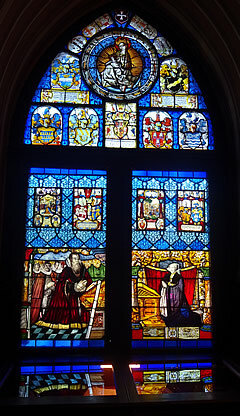 There is much fine stained glass here, none of it original to the castle but brought from elsewhere, some dating from medieval times. 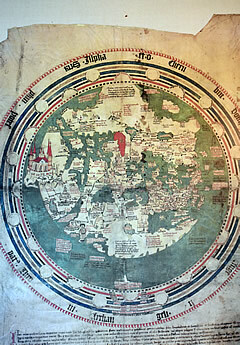 Copy of a 1448 map of the world by Andreas Walsperger, the original is held in the Vatican library.